"This recipe is a family tradition for holidays or just for fun! 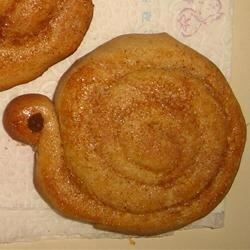 These cinnamon snails taste delicious and are fun to make!!" In a large bowl, cream together the butter or margarine and brown sugar until smooth. Mix in 1 teaspoon of cinnamon, baking powder, egg, and vanilla. Stir in flour by hand using a wooden spoon, as the dough will be stiff. Roll out tablespoon sized pieces of dough into 6 inch long ropes. Curl up one end slightly to make the head, then curl the rest of the rope towards the head in a spiral shape to make the snail shell. Place cookies 2 inches apart on the prepared cookie sheets. Brush cookies with egg white. Mix together the remaining cinnamon and superfine sugar in a small cup. Sprinkle this over the snails. Use chocolate chips to make eyes on the heads. Bake cookies for 8 minutes in the preheated oven, or until the bottoms are lightly browned. Let cool on the baking sheet for about 5 minutes before removing to wire racks to cool completely. Scaled to half. Real mushy, even after adding more flour. Also, this seems like a cookie recipe rather than the traditional "snails" I was hoping for.